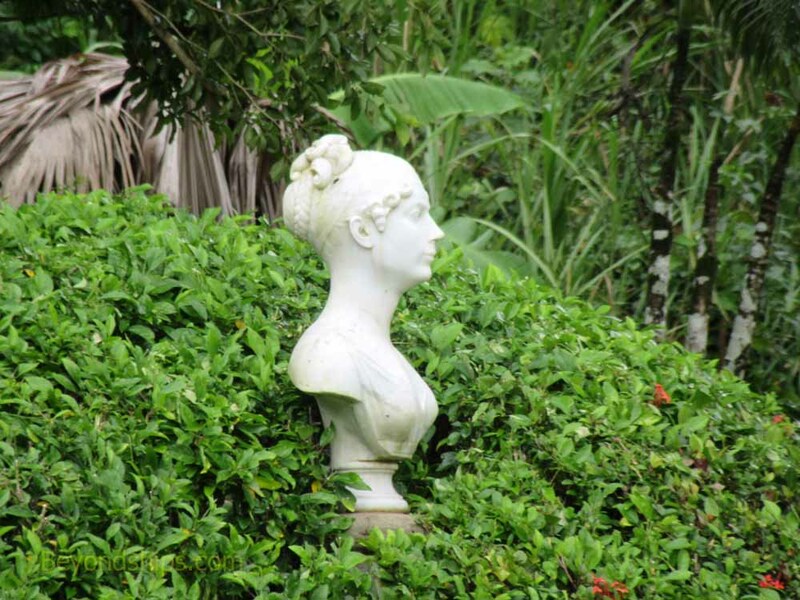 The Empress Josephine is probably the most famous person to come from Martinique. From rather modest beginnings on this Caribbean island, she went on to become the first wife of Napoleon Bonaparte, who crowned himself Emperor of the French in 1804. Napoleon dominated Europe at that time and his consort was very powerful. Furthermore, many of the present and former royal families of Europe can trace their ancestry to her. Josephine was not of royal blood. Born Marie Josèphe Rose Tascher de La Pagerie in 1763, her father was a minor aristocrat who managed sugar plantations on Martinique and the nearby island of St. Lucia. Indeed, there is some controversy over which island she was born on. Although Martinique is usually credited as her birthplace, there is evidence to suggest that she was actually born in St. Lucia. During this period, control of St. Lucia was shifting between France and Britain and the official records are incomplete. The fact that she was baptised in Martinique is sometimes explained as an attempt to avoid controvery over whether she was a French or British subject. Growing up, her family divided its time between the plantations on the two islands. On Martinique, they lived above the plantation's sugar mill. The great house had been destroyed by fire before Josephine was born and was never rebuilt reportedly because her father gambled away the profits from the plantations. Meanwhile, Joséphine's paternal aunt had been the mistress of François, Vicomte de Beauharnais, a wealthy but minor member of the nobility. In a scheme to keep control of the Beauharnais money after her lover died, the aunt arranged for Josephine's sister, Catherine-Désirée, to marry the Vicomte's son Alexandre. However, Catherine-Désirée died before the marriage could take place. The 16 year-old Josephine dutifully agreed to act as a substitute. To marry Beauharnais, Josephine left the Caribbean and walked onto the world stage in 1779. Her marriage to Beauharnais was not a happy one but Josephine quickly lost her provincial gauchness and acquired the skills necessary to succeed in Paris society. She had two children with Beauharnais, a son Eugene and a daughter Hortense. The 1780s was not a good time to be a French aristocrat. In 1789, the French Revolution erupted with the storming of the Bastille. The king and queen were executed and many aristocrats followed them to the guillotine during the Reign of Terror. In 1794, Beauharnais was arrested and executed. Although separated from her husband, Josephine was also imprisoned. Luckily, before she could be executed, Robespierre, the mastermind of the Reign of Terror, fell and was executed thus ending this bloody period. Free once again, Josephine made her way in Paris society by becoming the mistress of various political and military figures including Paul François Jean Nicolas Barras, who was one of the most powerful men in the land. Josephine was a notorious spendthrift and when Barras saw that a rising young general in the French Army named Napoleon Bonaparte was smitten with his mistress, he encouraged her to marry the hero of the battle of Toulon in the hope of reducing his expenses while at the same time gaining influence over someone who might be useful to him. While Napoleon was head over heels in love with Josephine, she was only mildly attracted. Although he had distinguished himself on the battlefield, Napoleon was still a provincial Corsican with none of the polish of her other lovers. He was also six years younger than she was. However, now in her 30s, Josephine realized that her days of getting by on her looks and sophisticated ways were drawing to a close and that she needed someone to provide for her and her children. Therefore, the two were married in 1796. 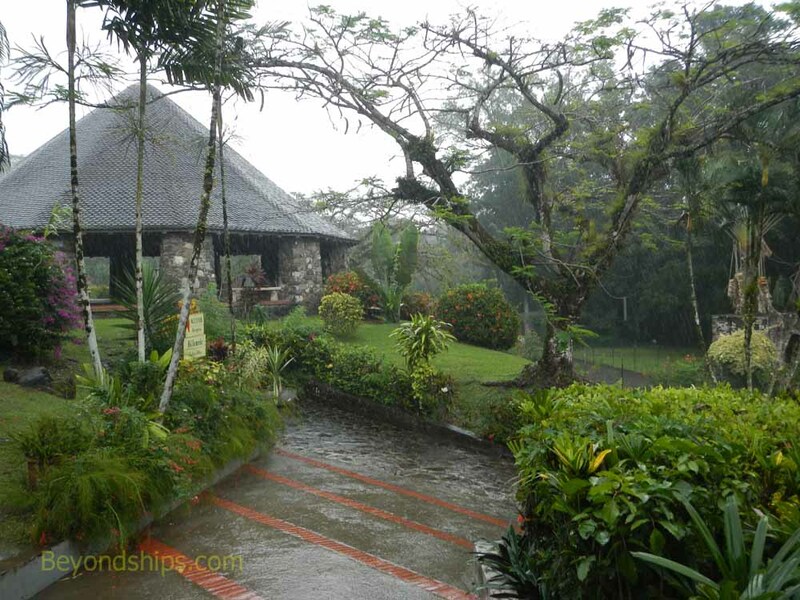 Above: The grounds of the former estate have been beautifully landscaped. When Napoleon led a French army over the Alps into Austrian-controlled Italy, he wrote his wife passionate love letters. As he won battle after battle, taking control of most of Italy, he pleaded for her to join him. However, Josephine was enjoying a series of affairs in Paris and had no desire to follow the army. The Bonaparte family had never liked Josephine and when Napoleon returned in triumph, they were only to eager to tell him what Josephine had been up to while he was gone. Napoleon flew into a rage and announed that he was going to divorce her. However, in a dramatic scene in which Josephine cried and pleaded through a closed door, Napoleon relented and the couple were reconciled. Disillusioned, Napoleon never felt the same way about Josephine again. Instead, the two became working partners with Josephine using her sophisticated social skills to aid Napoleon politcally. Although Napoleon subsequently took on several mistresses during the course of their marriage, there is no record of Josephine taking another lover. Josephine's love for her husband grew. And down deep Napoleon continued to love her. The last word he said before dying was her name. A national hero, Napoleon turned his attention to politics. Soon he became the most powerful man not only in France but in Europe. To give his dicatorial rule more legitamcy, Napoleon decided to create a new royal house for France. In a ceremony witnessed by the Pope, Napoleon first crowned himself Emperor and then crowned Josephine Empress. A nation which only a few years earlier had executed its ancient nobles delighted in the new princes, dukes and counts created from Napoleon's relatives and generals. Since Josephine had had two children by her first marriage, Napoleon believed that it was his fault that Josephine and he had no children. Therefore, Napoleon doted on Eugene and Hortense as if they were his own children. Eugene was given titles and important military and political positions. Hortense married Napoleon's brother and was made Queen of Holland. Through Eugene and Hortense Josephine became the ancestor of many of Europe's royal families. But when one of Napoleon's mistresses gave birth to a son, Napoleon realized that he was capable of fathering a child. Concerned about the future of the empire he had built, Napoleon began to consider whether he should divorce Josephine in order to marry a young European princess who could give him a legitimate heir. Much screaming and crying took place when Napoleon raised this possibility with Josephine. For a time, he dithered on this question, unwilling to hurt her. Eventually, however, he became determined and Josephine reluctantly agreed to an annulment. Napoleon insisted that Josephine retain the title of Empress. Knowing her spending habits, he also settled large amounts of money on her. She retired to her estate Malmaison outside Paris, which shares the same name as her girlhood home in St. Lucia. Following the disastrous Russian campaign and several defeats in central Europe, Napoleon was forced to abdicate in 1814. Many of the Allied leaders came to Paris in triumph and several met with Josephine. After walking with Czar Alexander of Russia in her beloved rose garden, Josephine died on 29 May 1814. In exile on Elba, Napoleon stayed locked in his room for two days after hearing the news.